My paternal 3rd great grandmother Hulda Lewis was born September 30, 1795, in New York, probably in New York City. I'm not sure I have the correct parents listed for her in my tree--Gilbert Lewis and Eliza McBride. In Confederate Memoirs, it is mentioned that Hulda was related to George Washington's brother-in-law Fielding Lewis who married George's sister Elizabeth (Betty), but I haven't been able to find a connection between Hulda and Fielding Lewis. What drew Hulda from New York all the way down to Savannah, Georgia, in the hot, humid south to meet and marry my 3rd great grandfather Frederic Edmund Tebeau there on February 20, 1817? Did Frederic meet her in New York? If so, what was he doing there? There must be an interesting story here. Hulda gave birth to nine children: Elizabeth Ann (1818-1819), John Robert (1820-1896), Catharine Sarah Melissa (1822-1889, my 2nd great grandmother), James Gilbert (1824-1851), Emeline (1826-1858), Mary Caroline Josepha (1828-1836), Lewis Charles (1830-1901), Frederic Treutlen (1832-1858), Sarah Washington (1834-1836). Hulda and Frederic had a house in town as well as a plantation in Chatham County, Georgia. 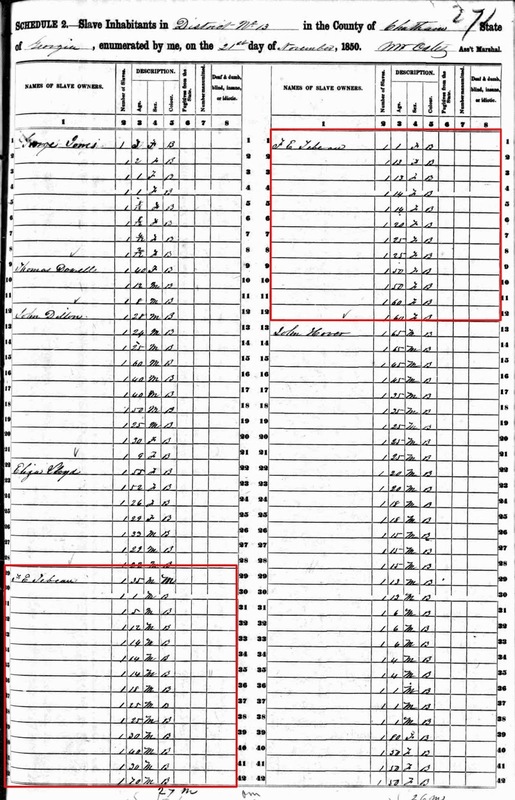 According to the 1850 U.S. Slave Schedule for Chatham County, they owned 26 people as slaves. The 1850 U. S. Slave Schedule for Chatham County, Georgia. Frederic and Hulda Lewis Tebeau's slaves are outlined in red. It sounds like Hulda didn't care too much for her home New York City. In a letter dated May 19, 1870, to her grandson Philip Pendleton, she wrote, "Now I perceive why I was so much troubled, on account of his [grandson William Pendleton] visiting N. Y., altho [sic] my own native city, I verily believe that it is the worst place in the whole world." Now I need to research what New York City was like during this time to make her say that! 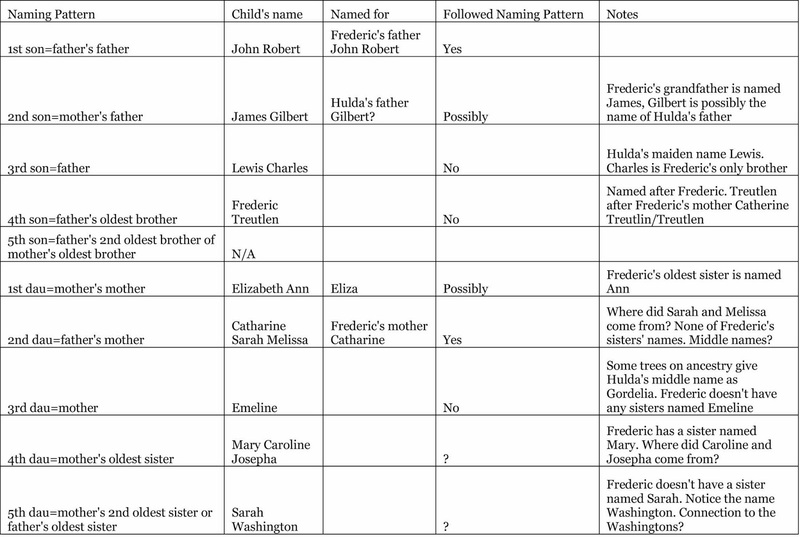 Based on the above naming pattern chart, it's possible that Hulda's father was named Gilbert, her mother was Eliza or maybe Elizabeth, and the other names that I can't account for are her siblings' or grandparents' names. The siblings I have for Frederic are Ann Margaret, Mary, Charles Watson, and Susan. At least I have a few clues to go on when I get back to researching who Hulda's parents were! Hulda died on November 21, 1875, and is buried in Springfield in Effingham County in the Tebeau cemetery. Constance Pendleton, ed., Confederate Memoirs: Early Life and Family History, William Frederic Pendleton and Mary Lawson Young Pendleton. (Bryn Athyn, Pennsylvania, 1958), 114, 149, 175.